Rapunzel is the classic fairy tale of a long-haired girl locked in a tower by a witch. 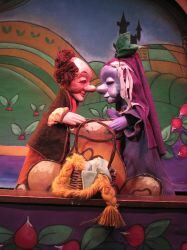 The Puppet Company’s telling is a version of the classic story by the Grimm brothers, not a Disneyfied version (“Tangled”) or the Sondheim version (Into the Woods). We are introduced to an older childless couple. The wife convinces her busband to sneak into the neighbor’s garden to steal some radishes (also called rapunzel). Unfortunately the “neighbor” happened to be a mean old witch and she catches the husband, and claims their daughter as compensation for her radishes. Rapunzel grows up, and so does her hair, and the witch hides her in a tall tower. The only way into thee tower is by climbing Rapunzel’s hair. One day as Rapunzel was singing in her tower a prince rode by, heard the beautiful melody and fell in love. Eventually the prince figured out how to get up to the tower and the two planned to marry. Then things got complicated! The telling of this story is done entirely by one puppeteer, Christopher Piper. Piper filled in for Eric Brooks who was called out of town unexpectedly. Entirely done with hand puppets, Piper does a remarkable job shifting sets, changing his voice, and telling the story in a very entertaining style. There were five different characters, and each had a unique personality. The set was made up of two different castles, plus the radish field, a wall (and the wall gets its own song too! ), and a briar patch. Colorful backgrounds helped set each scene. The children in the audience were caught up in the plot as well and seemed to enjoy it. And since it had been many years since I read the original Grimm Brothers version of Rapunzel, many of the story elements were new to me, leading to a very enjoyable piece of theater. 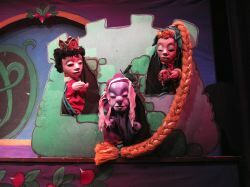 The Puppet Company’s Rapunzel was the classic fairy tale told with hand puppets in a very entertaining way. This article can be linked to as: http://showbizradio.com/go/8105.